TWO MEN AND A TRUCK believes every Mom should be celebrated on Mother’s Day, that’s why they’ve initiated “Mover’s For Moms!” and is teaming up with local organizations and 98.5 The Beach to collect essential items to be delivered to women living at Serene Harbor- Domestic Violence Center this Mother’s Day. To donate items or to find out how you, your school or organization can join TWO MEN AND A TRUCK in aiding mothers in crisis please call 321-242-7742! Donations are determined by individual shelters, but can include: nice soaps, hair styling products, shampoos and conditioners, pillows, blankets, slippers, and other basic clothing items. To see a full list of donation items that are recommended, please click here to download their list! TWO MEN AND A TRUCK has women in key leadership roles across the country — some of the most successful franchisees are mothers. 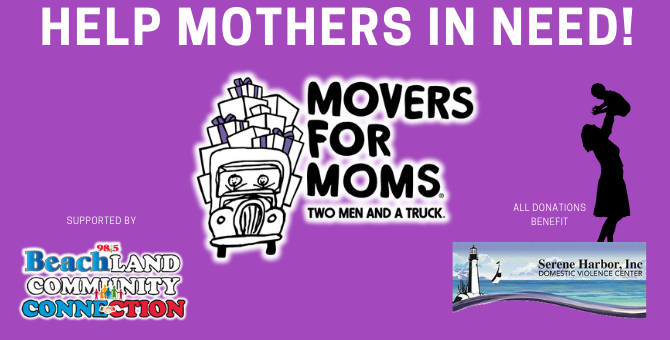 Movers for Moms® is a way for TWO MEN AND A TRUCK and all those who help to appreciate the efforts of mothers everywhere, despite their current circumstances. It was a record-breaking year in 2018 with more than 295,000 items collected and donated to shelters across the country! This truly helps moms in need get back on their feet and feel extra special on a day they may have otherwise been forgotten!! Movers for Moms® was a national program in 43 states; all franchise locations participated, supporting hundreds of shelters across the U.S.
Movers for Moms® collected more than 365,000 items in 2018! This generous donation brings us to a total of more than 1 million donated items throughout our 11-year program history!